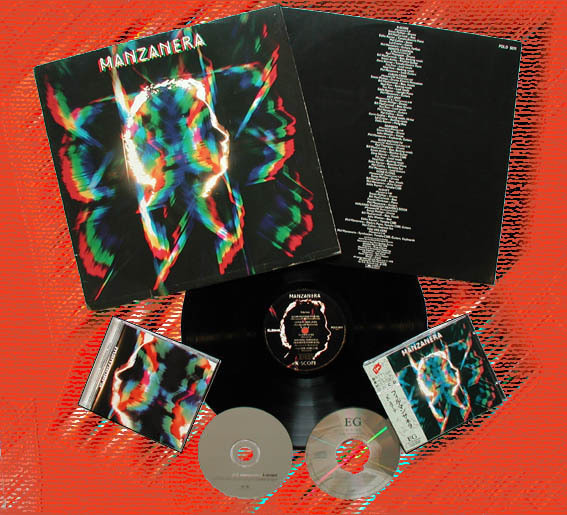 Phil Manzanera's 3rd solo album K-skope was originally intended to be called Kaleidoscope' but Siouxsie and the Banshees had released an album of the same name towards the ends of Phil's sessions. This album gathered together many of the musicians from his previous solo albums. Remote Control was released as a single in UK with K-Scope as its b-side. Remote Control (Live 1977), It Don't Matter To Me & Out Of The Blue (Live 1977) were added to the 2000 CD re-issue. Phil Manzanera Guitars, Farfisas On "K-Scope", Lead Gutars On "Remote Control", Guitars On "Cuban Crisis", Guitars On "Hot Spot", Keyboards, Guitars On "Numbers", Lead Gutars On "Slow Motion TV", Echo Gutar On "Gone Flying", Guitars On "N-Shift", Electric Piano On "Walking Through Heaven's Door", Synthesizer, Yamaha CS80 On "You Are Here", Guitar On "Remote Control (Live 1977)", Guitar On "It Don't Matter To Me (Demo)", Guitar On "Out Of The Blue (Live 1977)"
Simon Phillips Drums On "K-Scope", Drums, Electric Percussion On "Cuban Crisis", Drums On "Hot Spot", Drums On "Numbers", Drums On "Gone Flying", Drums On "N-Shift", Drums On "Walking Through Heaven's Door"
Eddie Rayner Yamaha Electric Piano On "K-Scope", Moog Bass On "Hot Spot", Bosendorf Piano On "Slow Motion TV", Yamaha CS80 On "Gone Flying", Yamaha CS80 On "Walking Through Heaven's Door"
Mel Collins Saxes On "K-Scope", Saxes On "Hot Spot", Baritone Sax On "Slow Motion TV", Soprano Sax On "Walking Through Heaven's Door"
Lol Creme Gizmo On "K-Scope", Backing Vocals On "Hot Spot"
Paul Thompson Drums On "Remote Control", Drums On "Slow Motion TV", Drums On "Remote Control (Live 1977)", Drums On "It Don't Matter To Me (Demo)", Drums On "Out Of The Blue (Live 1977)"
Bill MacCormick Bass, Backing Vocals On "Remote Control", Bass, Vocals On "Cuban Crisis", Bass, Drums On "Hot Spot", Bass, Backing Vocals On "Slow Motion TV", Bass, Vocals On "Gone Flying", Bass On "N-Shift", Bass, Vocals On "Walking Through Heaven's Door", Bass, Vocals On "Remote Control (Live 1977)", Bass, Vocals On "It Don't Matter To Me (Demo)", Bass, Vocals On "Out Of The Blue (Live 1977)"
Simon Ainley Rhythm Guitar On "Remote Control", Rhythm Guitar On "Slow Motion TV", Guitar, Vocals On "Remote Control (Live 1977)", Guitar, Vocals On "It Don't Matter To Me (Demo)", Guitar, Vocals On "Out Of The Blue (Live 1977)"
David Skinner Yamaha Electric Piano On "Remote Control", Yamaha CS80 On "Slow Motion TV", Keyboard, Vocals On "Remote Control (Live 1977)", Keyboards, Vocals On "It Don't Matter To Me (Demo)", Keyboards, Vocals On "Out Of The Blue (Live 1977)"
Andy Mackay Sax On "Remote Control (Live 1977)", "Out Of The Blue (Live 1977)"
Tim Finn Lead Vocals On "Remote Control", Lead Vocals On "Cuban Crisis", Lead Vocals On "Hot Spot", Lead Vocals On "Slow Motion TV", Lead Vocals On "Walking Through Heaven's Door"
Neil Finn Backing Vocals On "Remote Control", Backing Vocals On "Slow Motion TV"
Kevin Godley Backing Vocals, Hi-Hat On "Hot Spot"
John Wetton Voices On "Numbers", Bass On "Walking Through Heaven's Door"